Love will be in the air on Wednesday everywhere but the ice at The Arena at TD Place as the Ottawa 67’s host the Kingston Frontenacs in a mid-week Valentine’s Day matchup. 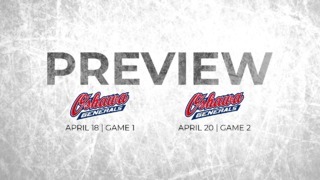 Winners of four-straight, the 67’s will look to add to their season-high winning streak while at the same time looking to snap a three-game losing skid against Kingston. 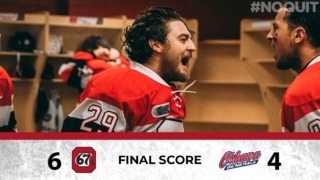 In addition to winning their last four games, the 67’s also have at least a point in their last eight and have fought back from a deficit in five of those games. Points are at a premium as teams push towards the OHL playoffs and Ottawa can once one again make a move up the standings if the 67’s can pick up points on Wednesday. As it stands, Ottawa trails Oshawa by just a point for sixth spot in the Eastern Conference and only trail the fifth-place North Bay Battalion by two. Ottawa has two games in hand on both teams. The Frontenacs, currently sitting third in the East, have won seven out of their last eight games with their only loss in that span an overtime defeat by the Owen Sound Attack. The 67’s and Frontenacs exchanged wins during the first four games of this season but Kingston won the following three. 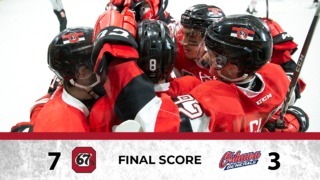 This will be the eighth meeting between these two sides and the Barber Poles will be keen to avenge a close loss during the last meeting between the two clubs, an overtime loss for the 67’s despite a strong fightback that saw Ottawa level the scores after being 4-1 down. The 67’s will have to be wary about Frontenacs’ leftwinger Linus Nyman who has seven goals and 11 points in his last five games. Mitchell Hoelscher has had points in each of his last five games. He has eight points over that stretch. Sasha Chmelevski has scored a goal in each of his last four games and has 12 goals and 21 points in his last dozen games. In the past three games, Chmelevski has scored the winning goal twice and assisted on the other. Tye Felhaber has scored points in five consecutive games. He has seven points in that span. The Frontenacs currently have eight NHL prospects on their roster. Kingston is comfortable entrenched in second play in the Eastern Conference, eight points back of Hamilton and 11 points up on Oshawa.